This private speed boat is all about having an unforgettable cruising experience on a private speed boat together with your family, partners and friends. 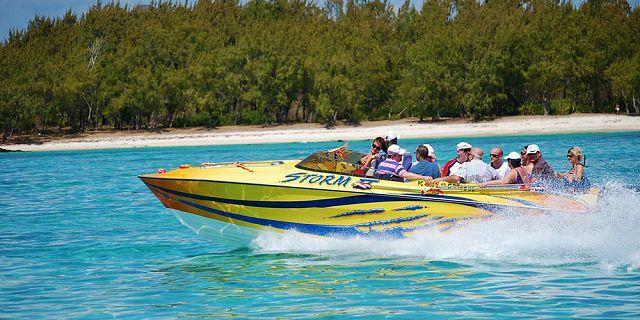 As part of this speed boat trip you will get to enjoy sailing through the crystal clear water of the east coast lagoons with breathtaking scenery all around. 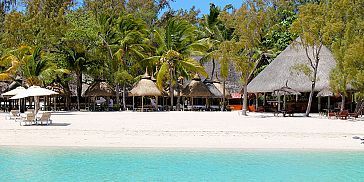 Stay on the beautiful white sand beaches of one of Mauritius’ small islands situated along the east coast (Ile aux Flammant, Ile aux Phares, Ile aux Aigrettes, Ile aux Cerfs Island), snorkel inside the lagoons and in Mauritius' most famous marine park, and enjoy delicious food and bar services (optional). 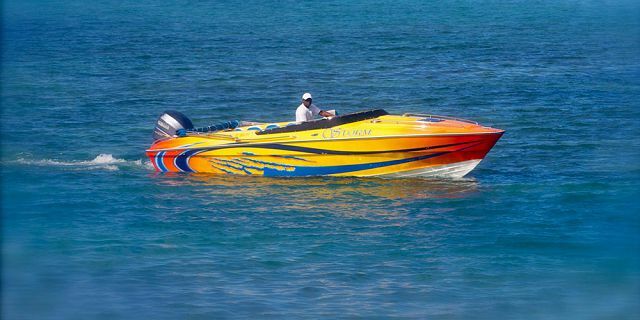 The speed boat is very spacious (26 ft in length), and can sit 10 passengers very comfortably. It is a multi-purpose boat, built for offshore travel as well as shallow lagoon cruising, making it the ideal for any day trip at sea. 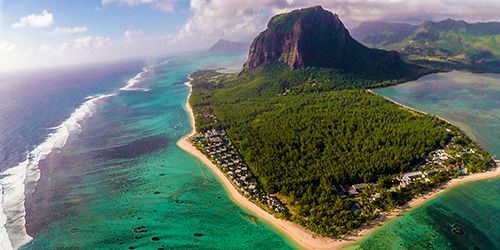 You can choose to travel a short distance and spend most of the day on Ile aux Cerfs Island, or travel all the way along the east coast to the south east of Mauritius for a visit of Blue Bay Marine Park and of Ile aux Aigrettes Island. When boarding the boat, you will encounter a warm and friendly atmosphere. Your Captain has a life-long experience on sea; he is highly trained in first aid and safety procedures, and is an accomplished fisherman. You are sure to be in the safest and most knowledgeable hands. 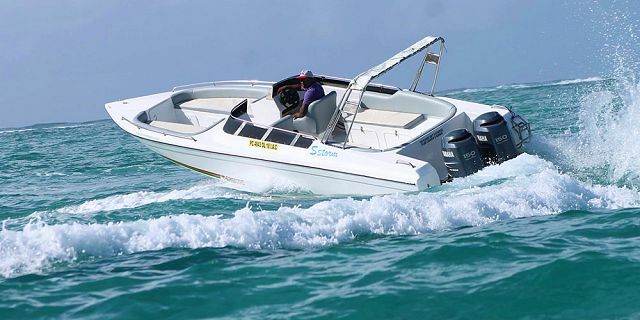 The boat captain is there to make sure you enjoy every minute of the trip, taking you to any place you want to go to, informing you about the different sights you see on the way, organize different sea activities for you such as waterskiing, and make sure your time is enjoyable. 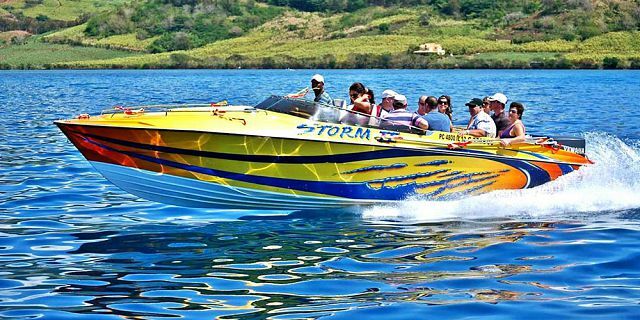 We can customize the speed boat trip as per your preferences, with that, we do recommend choosing one of the mentioned below day trips. Ile aux Cerfs Island - Île aux Cerfs Island, known in English as the deer island is an island near the east coast of Mauritius in the Flacq district. 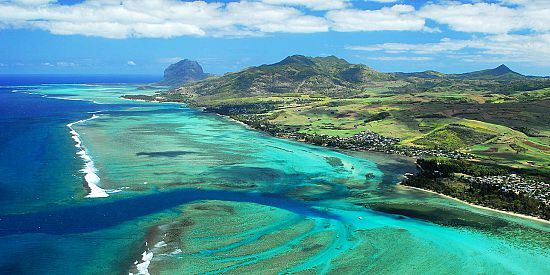 This paradise island of Mauritius constitutes of around 100 hectares of land. Nowadays there are no more deers on the island, but you will find there some of the worlds beautiful beaches and as such it is one of the must place to visit and see in Mauritius. Ile Aux Cerfs is famous for its sandy beaches, beautiful lagoon and big selection of activities and facilities. 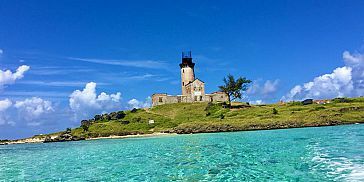 In Ile Aux Cerfs you are sure to have a day of relaxation and fun on one of the picture-postcard beaches, and to enjoy a swim and snorkeling in the lagoon. G.R.S.E. 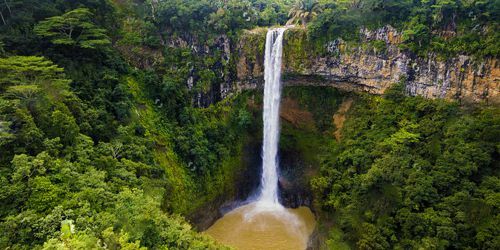 Waterfall - The Grand South-Eastern River is the longest river of Mauritius. The river ends up with a beautiful which is accessible by boat. The speed boat will take you along the east coast and then upstream the Grand River for an incredible view of the Grand River South-East Waterfalls. 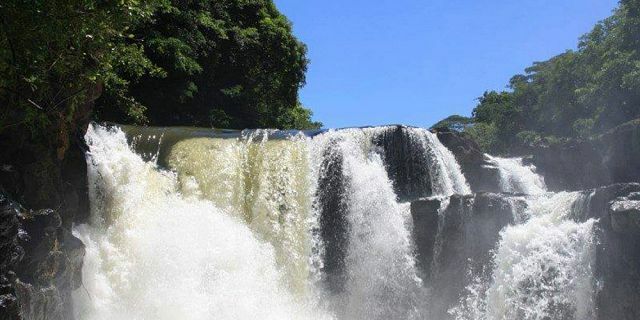 Once there, you will enjoy the view of the waterfalls. You could also admire the wild vegetation which takes root on the banks. 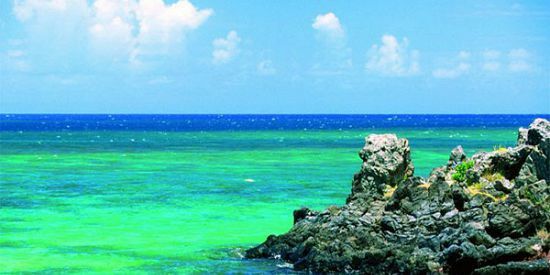 Snorkeling at the marine park - Along the way the speed boat can stop for you to enjoy snorkeling inside the largest lagoon along the east coast allowing you to enjoy the underwater marine life and swim amongst superb corals and brightly colored tropical fish. Snorkeling equipment is provided on the boat. 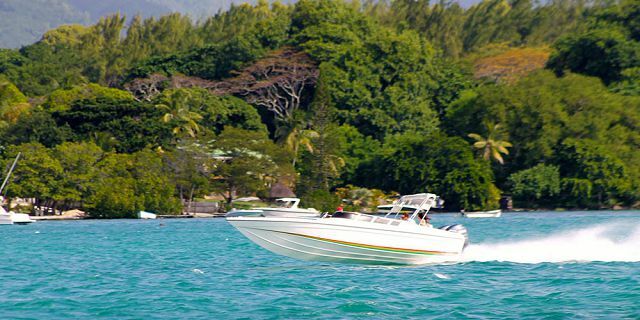 Blue Bay Marine Park - The Blue Bay marine park, situated on the South East coast of Mauritius near Mahebourg, is one of the best places to see the beautiful marine life and to go for snorkeling in Mauritius. Once you reach the bay of Blue Bay you will feast your eyes on some of the bluest waters and most breathtaking white sandy beaches you will ever see. When you see the turquoise blue color of the lagoon you will understand where the name comes from. The colors of the sea are incredible and are of variety of many different blues. The Snorkeling at the park is highly recommended as the colorful fauna and flora found at the park is absolutely stunning. At an average depth of 5.5 meters, with crystal clear water offering great visibility, the snorkeling conditions are ideal. You will have a great view of the reef, fish and of large selection of corals (there are more than 50 different species of corals at the park!). The Blue Bay Marine Park is home to mangroves, algae, sea grasses, corals, and other marine organisms. There is also a wide variety of fish species that include Damselfish, Surgeonfish, Butterfly fish, juvenile Sailfin tangs, as well as tiny Pipefish and large Trumpet fish. Ile aux Aigrettes Island - Ile aux Aigrettes is a tiny coral island (25 hectares) just off the coast of the town of Mahebourg at the South East of Mauritius. The island has been declared a nature conservation site and today is being preserved by the Mauritian Wildlife Foundation. 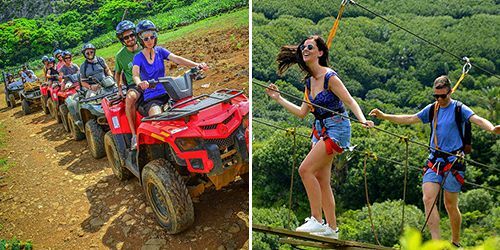 When visiting Ile aux Aigrettes you will get to see breath-taking scenery of the South East of Mauritius, and will be given a glimpse of the early history of Mauritius. You will also get to see beautiful trees with strange names like Ox wood, Pipe wood, Rat wood and Bottle palm. There is also the chance to see a rare orchid in full bloom. 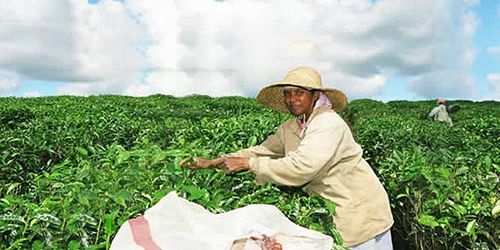 You will discover plants and animals, unique to Mauritius and found nowhere else in the world. 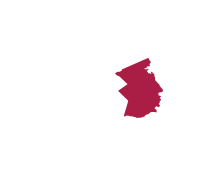 Some of them have come close to extinction like the pink pigeon, a bird that was in danger of extinction for many years. 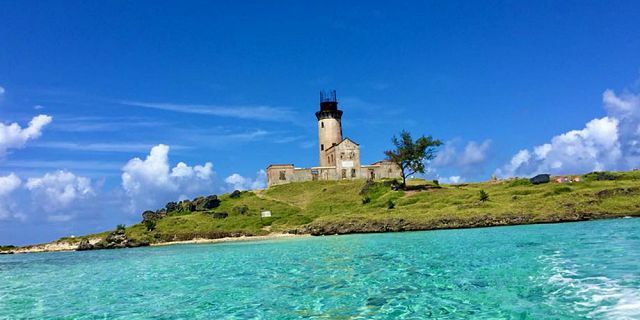 Ile aux Phare - L’Ile aux Fouquets also known as L’île aux Phare(Phare Island) is a small rocky island of the Grand Port Bay where its lighthouse which defied centuries still stands with all its majesty. The particularity of this famous island is its diversity of sea urchins of unique types. L’île aux Flamants - L’île aux Flamant(Flamants Island) is a bench of coastal sand situated in the east. This island, reputed for its romantic side, charmed numerous honeymoon couples. Parasailing at Ile aux Cerfs - It is possible to organize for you to do parasailing during your time on Ile aux Cerfs Island. The parasailing offers you a breathtaking bird's eye view of Ile aux Cerfs Island, its beautiful beaches and the beautiful east coast lagoon, making it a truly memorable and worthwhile experience. You can go for the parasailing as individual or as a pair. The parasailing is offered for an additional fee of 24 Euro/person. 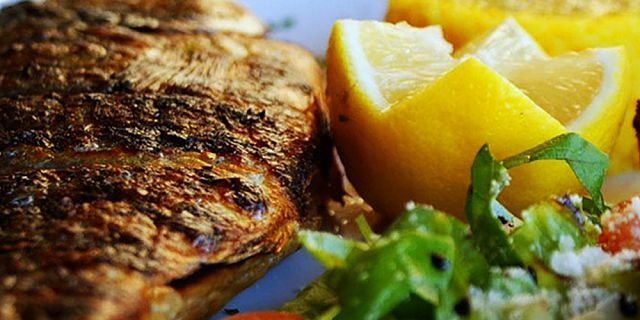 The lunch menu consists of BBQ Chicken and grilled fish, sausages, salad rawness, butter garlic bread, fresh pineapple and drinks (water, White wine, Red wine, Rose wine, Phoenix beer, Rhum, soft drinks, juice, mineral water) If you are a vegetarian, please advise us before, so we can arrange the necessary additions to the lunch. 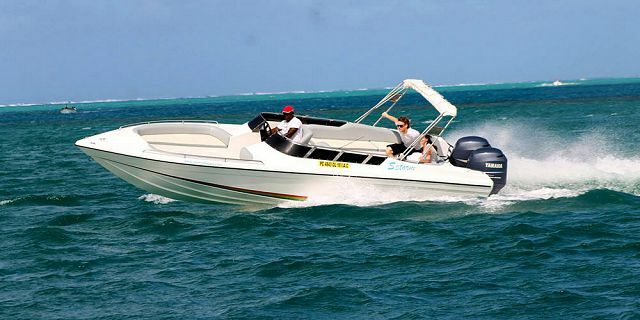 It is a very spacious speedboat (26ft), sits 10 passengers very comfortably. The boat is also equipped with a swimming ladder, safety equipment – life jacket / first aid kit, canopy for protection from the sun, and many other safety devices. It is powered with two 175hp Evinrude outboard engine. The boat offers excellent performances, comfort and reliability even in challenging ocean conditions, and is designed to cope with high seas. 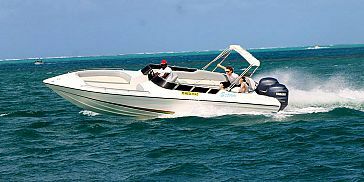 It is a multi-purpose boat, built for offshore travel as well as shallow lagoon cruising, ideal for excursions anywhere in Mauritius. 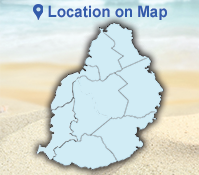 What to bring: We suggest bringing hats, sun block cream for sun protection, cameras, towels, sunglasses, swimsuits. The starting and ending times of this tour is flexible and should you have any preference in regards to the starting / ending time, you are kindly requested to leave a comment about the same under the Comments & Requests box while doing your booking.